This topic contains 2 replies, has 2 voices, and was last updated by stanman 2 months, 1 week ago. 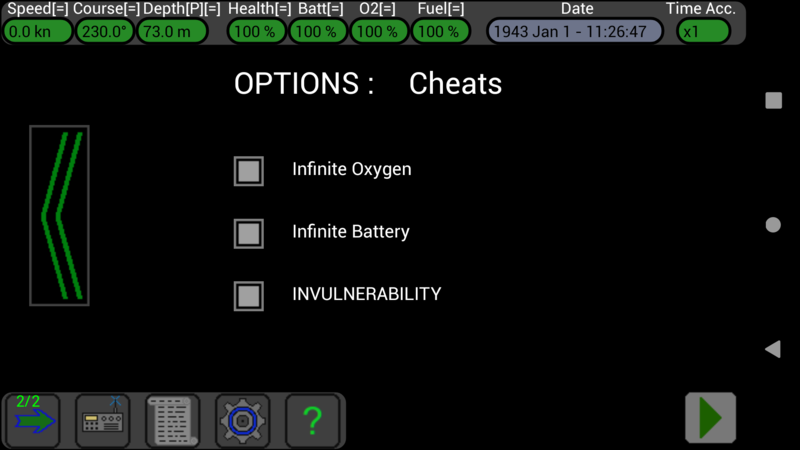 Hi, I am requesting that realistic battery, max depth, and oxygen quantity are optional. My favorite part of the game is exploration and hiding. I’d love to be able to stay underwater and move around freely for a long time and over long distances, down deep. However, the game is awesome nonetheless. Thank you! Infinite O2, infinite battery and invulnerability ! You can play with them enabled or disabled, as you prefer, and you can find them inside the “Options” screen. I just released the new V1.35 version of the game in the Google Play Store. Its been a lot of fun to play with this.